At the beginning of his turn, Jia Wen He can select any character. At any point during this turn, he can view their hand. 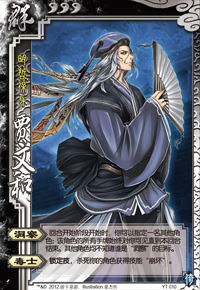 The character that kills Jia Wen He gains the ability "Collapse." When Jia Wen He uses "Insight", the properties last throughout the entire turn. If Jia Wen He uses a Break or Steal on the same target, he gets to look at their hand at the same time. "Collapse" is one of Dong Zhuo's powers. "Poison" is not a choice. Even if Jia Wen He is accidentally killed by a friend, whoever killed his gets "Collapse".